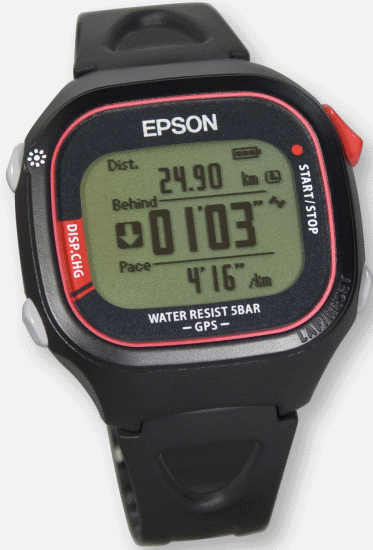 TOKYO, Japan, February 21, 2012 – Seiko Epson Corporation ("Epson," TSE: 6724) has developed the world's lightest GPS-enabled running monitor, which also boasts an extremely thin design. Designed to be worn on the wrist and equipped with long battery life, the monitor uses GPS to provide runners with accurate distance, pace and other data. Epson plans to release a commercial version of the monitor in Japan in 2012 as the company's first entry in the electronic sporting goods market. Demand for running equipment has soared along with an escalating number of distance runners and races in Japan, Europe, America, and other developed economies. Looking to serve this demand, Epson developed a comfortable, unobtrusive GPS running monitor that provides long battery life, accurate running data, and excellent water resistance, ensuring maximum appeal to weekend joggers and serious racers alike. Despite its compact size, the monitor has a remarkably accurate built-in GPS module. Strapped to a wrist, the monitor will provide runners with accurate performance data on the fly, including distance, pace, and speed, on any course, so that they can train with maximum effectiveness and enjoyment. The running monitor can operate for up to 12 hours on a full charge with GPS tracking on - more than enough time for long-distance events, from full marathons to trail runs. The long battery life means the monitor will require less frequent recharging. So, for example, a runner who used it for five hours a week with GPS tracking on would not need to recharge the unit for a full two weeks. Epson's GPS running monitor is also incredibly lightweight - it tips the scales at no more than 50 grams, making it the world's lightest GPS-enabled running monitor. And, despite the built-in GPS module, it is a sport wristwatch-like 13 mm thick. A comfortable and flexible strap will make runners forget they have it on. Impressive water resistance will offer added peace of mind. Ordinary GPS running watches are rated to meet the IPX7 immersion protection standard, which means they can be fully submerged in water no deeper than one meter for a maximum of 30 minutes. Epson's running monitor, however, is water resistant up to 5 bars, or 50 meters of water. This level of protection means users can safely use the monitor not only in a downpour but even while showering or swimming. To develop a thin, lightweight GPS running monitor capable of accurately measuring running data for a long period of time on a single charge, Epson drew on its extensive experience and technology in semiconductors and quartz sensing technology to develop a compact, new, high-accuracy, low-power GPS module. Moving forward, Epson is looking to help people enjoy healthier, fuller lives by using its technologies and skills in sensing, low power, and device downsizing to provide wrist-wearable devices and web-based services for the growing electronic sporting goods and healthcare equipment markets.